This is the centroid moment tensor published by the USGS as of 01/10/18 (it will likely be updated in the future). As you can see this was an almost pure strike-slip mechanism on a near vertical plane. Tsunamis are generated when the ocean floor is displaced upwards by an earthquake, displacing the water above it in the same pattern. This displaced water then spread out laterally to form the tsunami. Thrust faults tend to produce large seafloor uplifts and so most (maybe all?) 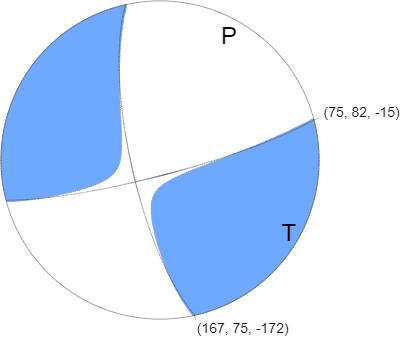 tsunamis are associated with thrust faulting earthquakes. There was no tsunami in this case because a strike slip fault like this does not produce a significant uplift of the seafloor. Instead the seafloor slides past each other. With regard to the second part of the question; yes there have been tsunamis in the Caribbean before. This website provides a good list of known ones. The reason why there was no large tsunami is due to the reason above, no significant uplift of the sea floor. However, a small tsunami was produced. This was due to vertical features such as trenches and seamounts (basically, undulating bathymetry) moving laterally, in a strike-slip earthquake acting as paddles within the overlying water column. Not the answer you're looking for? Browse other questions tagged earthquakes seismology tsunami or ask your own question. Mega-tsunami, what is the greatest possible height of a tsunami? How accurately can a tsunami be predicted? Have there been any successful evacuations? How can a tsunami be 'hot'?